A couple of weeks back, our garage freezer went out and sadly by the time we noticed it was too late. The entire hunting season’s haul of deer meat was ruined. J was devastated, naturally, and there was nothing we could do to re-stock what was lost since deer season is over. Thankfully, a co-worker of J’s is also an avid hunter and he gifted us with some of his stockpile of venison. One of the things he gave us was zesty Italian deer sausage, that he had processed himself! 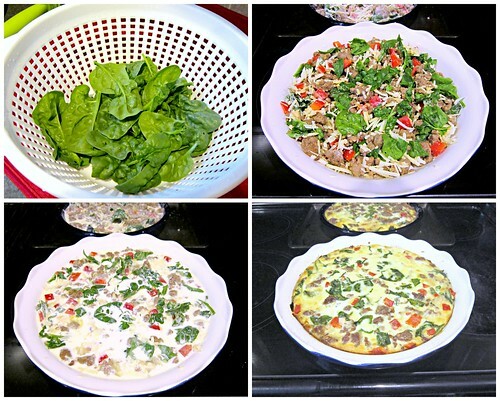 Of course, J was anxious to try it, and since he loves crustless quiche, that seemed like a good place to start! It didn’t hurt that this month’s What’s Baking challenge, hosted by Liz of Books -n- Cooks is also quiche!! Meant to be? I think so! And as if the gifted meat, yummy quiche, and fun challenge weren’t enough excitement, I also got to use the first crop of spinach from our garden for this recipe!! Admittedly, J and I aren’t seasoned gardeners and we didn’t do a lot of research before planting this year so we planted spinach. Which we now know is better planted in the fall. Thankfully, we’ll be able to get some good production from it before the summer heats kills it off. We will definitely enjoy it while it lasts, and know to plant it in the fall next time. Lesson learned! 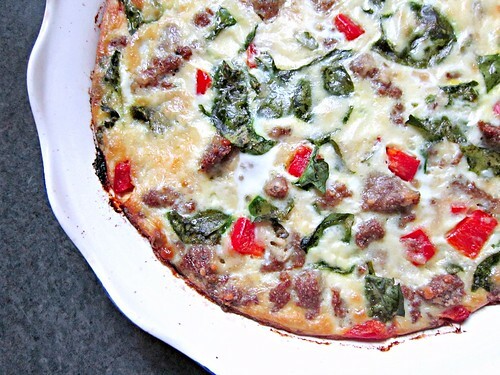 I’ve made crustless quiche numerous times over the past couple of years, experimenting with different meats, cheeses, and veggies, but the base recipe for the quiche is always the same. And it’s so simple. It is probably one of, if not the only dish that I can make without having to reference the recipe. That’s a big deal for me, because I pretty much have to reference a recipe for everything. Even if I’ve made it a gazillion times. I think it’s more for peace of mind than anything. Now, that’s not to say I never make up recipes on the fly, but if it’s a repeat or whatnot, I want that recipe in front of me. Just in case. Ya know? All that to say…I don’t feel the need to do that with this quiche. The egg base of the recipe is three easy ingredients. Could even be two!! Eggs, heavy cream, and milk. The filler ingredients…whatever your little heart desires! Meat(s), veggie(s), and cheese. Definitely cheese. And a sprinkling of flour to help it set up. Be sure to check out Liz’s blog for the round-up of posts later this month, as well as the bottom of this one for links to the other yummy posts!! Preheat oven to 350 degrees F. Spray a 9″ round baking dish or pie plate with cooking spray, set on a baking sheet for easy handling, and set aside. Heat a medium skillet over medium-high heat and cook sausage, breaking up with a spatula, until browned and cooked through. Remove to a paper towel lined plate to drain off any excess grease and allow to cool slightly. 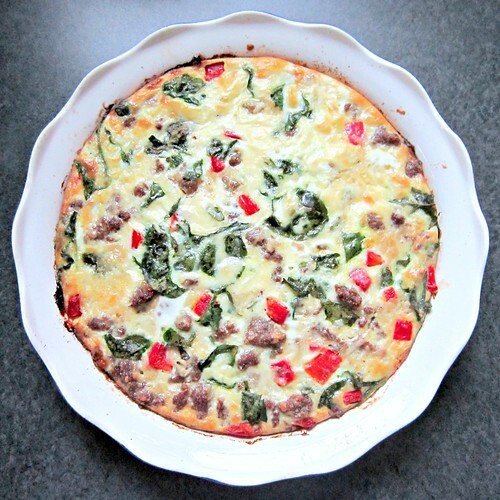 In a medium bowl, add the cooled sausage, red bell pepper, spinach and cheese. Sprinkle with the tablespoon of flour and toss to coat and mix. Dump the contents into the prepared baking dish and spread out as evenly as possible. Using the same bowl, add the eggs and beat. Pour in the cream and milk and stir to combine. Season with salt and pepper, stir once more, then pour over the filling ingredients in the pie plate. Use a fork to help evenly distribute the egg mixture, if necessary. Place in the oven and cook for 45 minutes. Top will be a bit jiggly still and edges slightly browned. Allow to cool and set for 30 minutes prior to cutting. Once set, cut, serve, and enjoy!! I need to convince my father-in-law to make me some venison sausage next year! 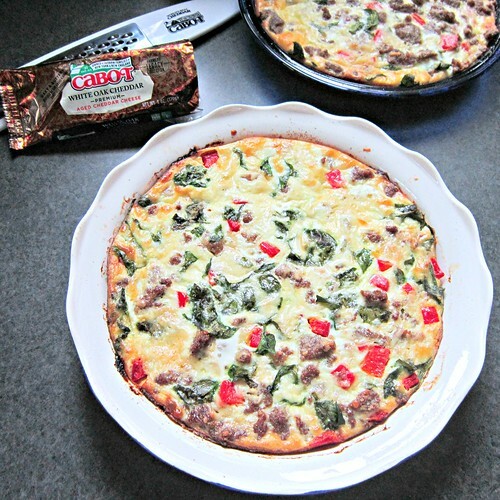 This quiche looks wonderful – so happy you were able to participate in this month's What's Baking!